A spokeswoman says the 23 signs across the city are part of a larger "Innovation Week." Mayor Frank Scarpitti of Markham, Ont. is pitching his city as the new home of Amazon HQ2. MARKHAM, Ont. — A city just north of Toronto is making a play to try to position itself as the home for Amazon's second North American headquarters. Markham, Ont. 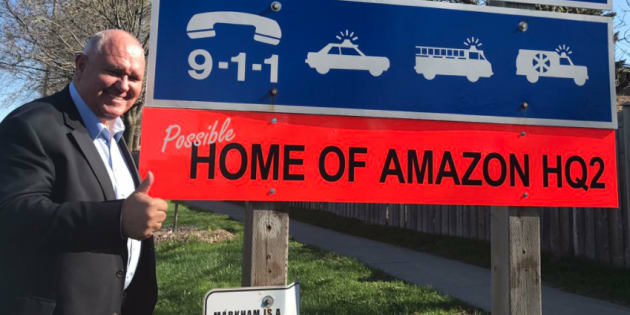 — one of 10 Canadian cities that joined with Toronto to bid for the hub — installed 23 bright orange signs on Monday throughout the city, dubbing it the "possible home of Amazon HQ2.'' It simultaneously launched a social media campaign and website called #ChooseMarkham. The Greater Toronto Area is the lone Canadian candidate to make the shortlist of 20 cities — whittled down from 238 proposals — still vying for the multi-billion-dollar headquarters. Markham's campaign signals a shift away from the GTA's passive approach to marketing itself against the American metropolises still in contention, such as Los Angeles, New York City, Philadelphia and Atlanta. "I wanted to inform our business community and our residents that when you hear the Toronto bid, that Markham is very much a part of that,'' said Markham Mayor Frank Scarpitti, in a call to the Canadian Press that he made while standing by one of the newly-erected signs that he said were generating honks, but also shock from locals who had no idea Markham was in the running for the headquarters. Markham is one of 10 cities that joined with Toronto to bid for the hub. Scarpitti scoffed at the idea that Markham's campaign would make the other cities included within the Toronto-bid feel slighted because he said he expected all of the municipalities to be pushing for the headquarters and using it as an opportunity to boast about what they have to offer. In Markham's case, that's 37,000 jobs in technology and related sectors and 1,500 high-tech companies, including General Motors' new Canadian Technical Centre and massive offices from IBM Canada and Huawei that Scarpitti has been highlighting as part of the city's "Innovation Week.'' Executives from the company appear in testimonials on the city's Choose Markham website. If Markham is successful in nabbing Amazon, those numbers would grow because the company has vowed to deliver up to 50,000 high paying jobs and a US$5-billion investment. He said he felt Markham's tactics were not part of "the race to the bottom'' that other cities bidding on locations for Amazon or other big companies have engaged in. Before falling out of contention, Calgary emblazoned the sidewalks across from Amazon's current Seattle headquarters with messages including, "Hey Amazon. We'd change our name for you. Calmazon? Amagary? Love, Calgary ;)'' and hung a 30-metre banner outside saying, "we're not saying we'd fight a bear for you, but we totally would.'' The same message ran in a full-page ad the city took out in the Seattle Times. Halifax rolled out a flashy website mirroring Amazon's fonts and buttons to claim that locating a second headquarters in that city would bring Amazon a savings of more than $10 billion over 10 years. Winnipeg enlisted Blue Bomber football star Obby Khan and Mayor Brian Bowman in a cheeky video with Alexa, while Sault Ste Marie suggested that employees could canoe to work in a bid to attract the tech giant. Hamilton even put $467,000 of cash behind its pitch, which it said was a 50/50 split between public and private funds. Markham said its marketing plan has ``little to no cost'' and most of the work associated with it has been done internally.